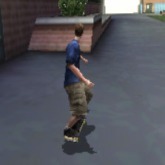 Description: In the early 2000's the Tony Hawk series was amazing! A skateboarding game that would rule all others that came out before it. You could choose to play as real life pros such as Tony Hawk, Geoff Rowley, Andrew Reynolds and more. In each level players have to complete a number of missions such as high score or find the letters for skate! It had a brilliant sound track and the gameplay is amazing! Game Controls: Arrow Keys = Move. Enter Key = Start Button. "K" Key = Select. "L" Key = Ollie. "I" Key = Grind Button. "O" Key = Grab Button. "U" Key = Flip Button.